WASHINGTON (AP) - Top-seeded Andy Roddick and unseeded James Blake won straight-set semifinal matches to advance to the final at the Legg Mason Tennis Classic on Saturday. 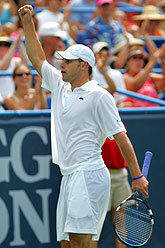 Roddick beat 13th-seeded Paradorn Srichaphan 7-6 (4), 6-2, advancing to a final for the 29th time in his career. Blake then beat 10th-seeded Tomas Berdych of the Czech Republic 6-4, 6-3 in the other semifinal to reach his fourth career final. Roddick and Blake in the final means an American player is guaranteed to have won each of the first three U.S. Open Series events. Roddick, who last reached a final at Wimbledon on July 3, will be going for his fourth title of the year and the 19th of his career on Sunday. Blake's lone title came in this event in 2002. In the first semifinal, Roddick slipped by in the fourth tiebreaker to win the first set and broke serve in the first game of the second set as he improved his career mark against Srichaphan to 6-1. In the match, Roddick won 94 percent of his first-serve points, 85 percent of his second-serve points and had 13 aces, including one clocked at 141 mph in the sixth game of the second set. Paradorn said the momentum swung when Roddick broke serve to open the second set. "I played a good first set. But (in the first game of the second set) I just kind of lost it. And it's hard to get back because he serves big,'' Srichaphan said. "If you play someone like (Ivo) Karlovic or Roddick, you have to concentrate on their serve. One break is enough to lose. Blake was dominant in dispatching Berdych, winning 94 percent of his first-serve points and breaking the Czech's serve twice, once to win the first set and once to take a 3-1 advantage in the second set. Blake was playing in his first semifinal since Long Island in 2003. It was his third straight two-set victory and his sixth straight win overall. Berdych double-faulted six times in a failed bid at reaching his third career title match. Blake's showing here this week signals his return as one of the top players on tour. Last year, he was ranked 39th before suffering a fractured vertebrae during a practice session in Rome. He attempted a return here last August, but lost in the first round and appeared in just one tournament the rest of the year as his ranking dropped 201. Blake entered the week at No. 101. In doubles play, Radek Stepanek withdrew from the tournament Saturday, citing increased pain from a pulled back muscle he suffered in a second-round singles match on Wednesday.